Migrate and modernize the manual, offline process of faxing! While fax machines seem like a technology of the past, many of our clients rely on fax machines daily. VCloud helps streamline communication with such businesses and understands the critical value of these faxes as well. Inbound fax can come in via email or forward it as an outgoing email. We store a list of your sent and received faxes, along with the media, for 180 days (option to extend or shorten the time limits are available). You can filter by source and destination number. 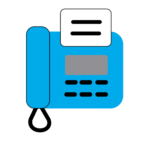 Purchasing fax numbers for our clients takes seconds. Deploying them for live production takes minutes. Allow us to also search for vanity FAX phone numbers which builds brand awareness.